A fuse is the simplest Over Current Protection device (OCPD) in electrical circuits, yet it is very important. A fuse is a two-terminal device which is placed in series with the circuit it is supposed to protect. It performs its function by melting itself out when the current tries to exceed the specified level, thus breaking the circuit open. Once operated (fused) it must be replaced. Replacing is not a problem because fuses are relatively inexpensive. Fuses are mainly of two types. Fast-reacting fuses and slow-blow or time delay uses. Ordinary fuses are of the former type. They melt immediately as the current exceeds the rated value. Quick-acting fuses are used to protect sensitive circuits which cannot tolerate even a temporary overload. Slow-blow or time-delay fuses are meant to ignore sharp surges in current, e.g., the in-rush currents at the start of a motor. Thus, both types have their function, and must be chosen accordingly. Fuses invariably consist of a fusible link of high resistivity material between two end caps or terminals. The link is enclosed in glass or some other material. At the rated current the I2R heat causes the link to melt and create an open circuit across the terminals. Thus, overcurrent is prevented. A time delay fuse is similar except that it has greater thermal inertia. The thermal inertia is created by providing an electrical insulator around the fuse wire with good heat diffusing capability. 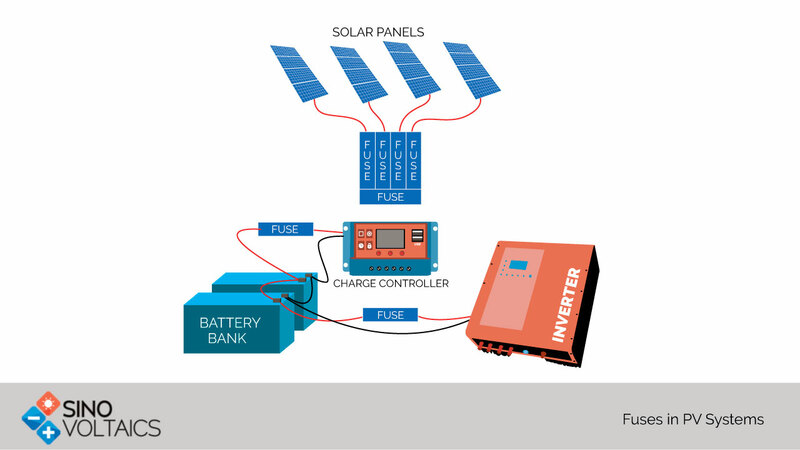 PV systems have a special configuration different from the usual household loads. Cells are configured in series to form modules in order to raise the voltage to tens of volts, say, 45V. The modules are connected in series to form strings which raises the voltage to around a thousand volts or above. Arrays of parallel strings are made using string combiner boxes to multiply the current. The combiner also houses a dc disconnect switch. Within the combiner box each of the positive and the negative terminals has a fuse in series. Arrays in parallel are further combined in a recombiner box to raise the current level further. The recombiner also has a DC disconnect switch which leads to the DC side of the inverter. Apart from the form, fuses are electrically rated by the voltage and current they are supposed to handle. These ratings are specified at specified environment conditions, e.g., temperature, and must be derated at higher temperatures. Protection devices are specified according to IEC 60269-6 (volume 6 of IEC 60269-6) and UL 248-19 for protecting the PV modules during overcurrent conditions. IEC recommend 20% margin in voltage and 25% in overload current. UL recommendations are nearly the same. String Fuse (PV Source Output)– If each module is rated, say at short circuit current of 9A, a conservative design for the PV fuse will have a rating of 1.56×9=14.04 A. (1.56= 1.25 x 1.25, or two margins of 25% each, one in Isc and one in OCPD). The conductor rating should be higher than the fuse rating so that the conductor is protected by the fuse. However, the conductor should be rated to 9x (n-1) A where n is the number parallel strings. Voltage rating of the fuse should be at least 20% higher than the string voltage. Array Protection Fuse– The current rating will be n times the short circuit current of one string (same as a module s/c current) where n is the number of strings in parallel forming the array as above. Similarly, successively larger currents will need larger fuses till the input of the inverter. It is always good to refer the IEC and UL specifications for guidance. Very good resume and straight to the point.